Just east of State Route 49, the Cosumnes River splits into several forks. The Middle Fork goes east for about 20 miles before it is crossed by two bridges at Mount Aukum Road (County Road E16). 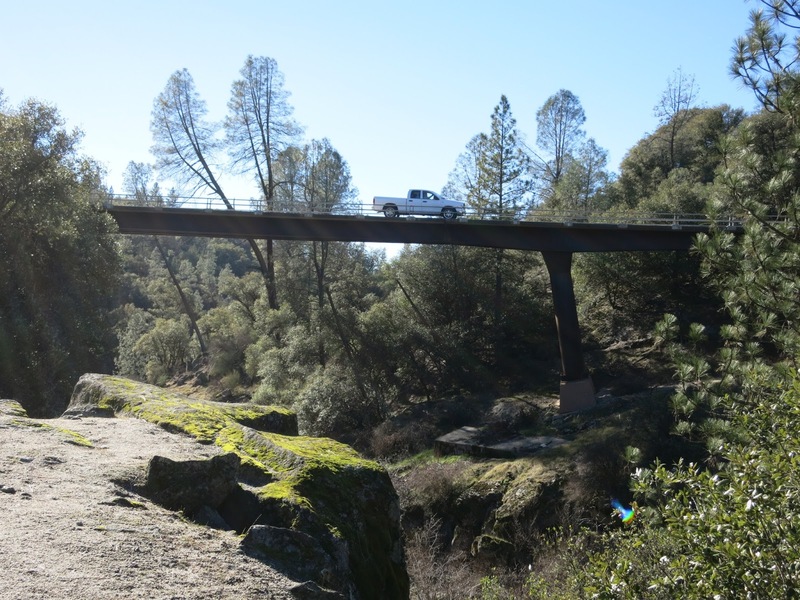 The newer Middle Fork of the Cosumnes River Bridge (25C0027) is a 3-span steel girder bridge (built in 1968) on a 40 degree skew with a 38.6 m length middle span. A bridge with steel girders and steel columns is quite unusual for California. I've noticed that whenever a bridge engineer gets an opportunity, they like to slope their bents. Unfortunately, the earthquake performance suffers as a result of the increased axial load and shear in sloping bents. We'll take a closer look at this interesting bridge tomorrow. El Dorado County, California Bridges: Mt Aukum Bridge across the Middle Fork of the Cosumnes River (1) by Mark Yashinsky is licensed under a Creative Commons Attribution-NonCommercial-ShareAlike 3.0 United States License.